My passion lies in helping families during the early intervention years. Early childhood (i.e., birth to 3-years-old) is an incredible time for brain development. In fact, learning and development are most rapid during a child’s first years. And these early years set up how your child will learn and develop later in life. We know from tons of research that when we provide services to children early, they can catch up to meet their developmental milestones AND be successful when they enter school. Why am I telling you all this? 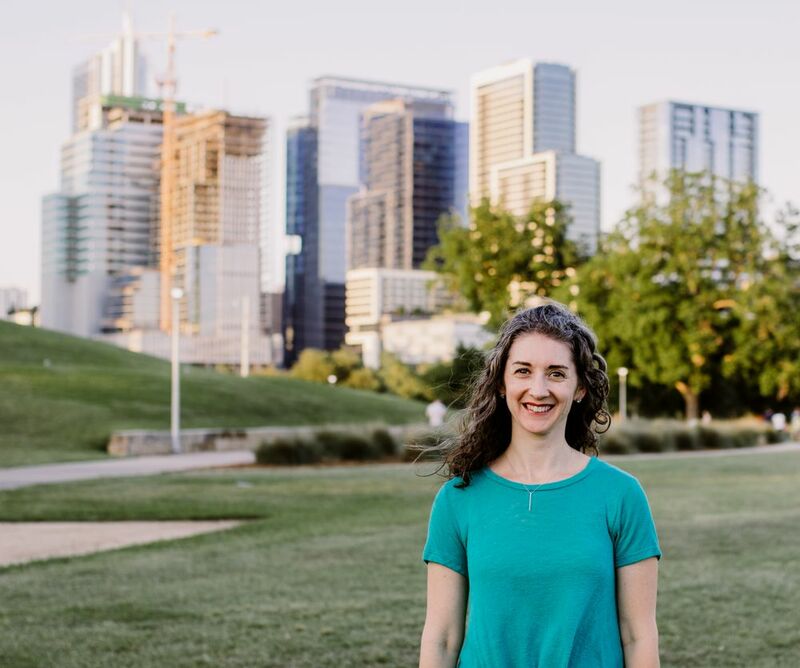 I realized, in reflecting on my past Playing With Purpose posts, that many of the toys and activities I talk about are for children ages 2 years and up. Thus, I chose an activity for our younger kids–stacking cups. On average, stacking cups are appropriate for children 6 months and older. They are a great toy to introduce to your baby when he can sit up on the floor. And you can continue to play with the cups as he grows. 1. Build a tower while building eye contact. Eye contact is a cornerstone of communication. It’s one of the earliest forms of communicative intent a baby develops. Eye contact never stops being an important communication skill–as adults we use it in conversation to show we are engaged and paying attention to a speaker. Sit on the floor with your baby seated across from you. Start by placing the largest stacking cup on the floor (remember, you are going to build a tower). One-by-one, hold a cup up near your eyes to direct your baby’s attention to you and the stacking cup. Sometimes I will make a little sound to get a child’s attention if needed as well. As soon as your baby looks at you, smile and get excited which will reward the behavior you’re looking for–the eye contact. Then stack that next block up. Once the tower is built, knock it down for a little fun and make it again. 2. Play a simple turn-taking game while stacking the cups. Turn-taking is another vital communication skill we can introduce to our children early. Once your child is old enough to hold onto the cups and stack them, play a turn-taking game with her. This simple back-and-forth exchange is the foundation for later conversation skills or playing a game with friends. You may need to hold onto the stacking cups and hand them to your child on each of her turns to begin. As she becomes more familiar with turn-taking, they can stay in a pile on the floor. Model saying “my turn” and “your turn” on each exchange but do not expect your child to use those words until she’s older. Some of the earliest developing sounds we hear from children are the sounds the vowels say. Think about your child as he coos or when he babbles; you likely hear many sounds like “eeee,” “oooo,” and “aahh.” So words like up, on, and in are both easier for our little ones to say and also appropriate for playing with stacking cups. As you build a tower, say the word ‘up’ each time you place a cup on top. Or, while stacking the cups, say the word ‘on’ with each cup. After you have modeled these words for a bit, pause before you say the word to give your child an opportunity to imitate you. If they mimic you, then that is great, but do not be discouraged if they do not. Repetition is the key when it comes to learning a new skill or developing a new sound or word. 4. 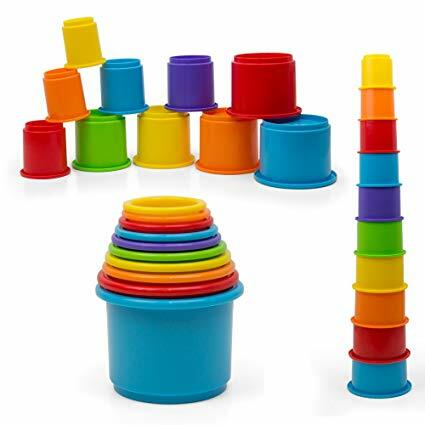 Hide objects under the stacking cups and play peek-a-boo. Start by getting down on the floor so that you are face-to-face with your child. Next, say “let’s play peek-a-boo’ and hide a small toy or snack under one of the cups, so your child sees you do it. Then say, “where’s the cracker?” It may be helpful to ask this questions a few times and build anticipation with your voice. Then, quickly pick up the stacking cup, look directly into your child’s eyes and say, “boo!” Early on it is important to say only “boo” rather than ‘peek-a-boo.’ This simple sound combination of ‘b-oo’ is a word your little one is more likely to be able to imitate. Making this deliberate word choice sets her up for success. Imagine, she imitates you and says “boo” so you get very excited which reinforces this new speech/word. The more you reinforce the words your child uses, the more likely you are to hear them again! 5. Make a sound tower by stacking cups for your older child. Stacking cups are also great for our older children working on colors and numbers. Most sets of cups come in different colors and often have numbers stamped on the bottom. You can certainly ‘count on’ hours of fun with your stacking cups for kids of all ages. 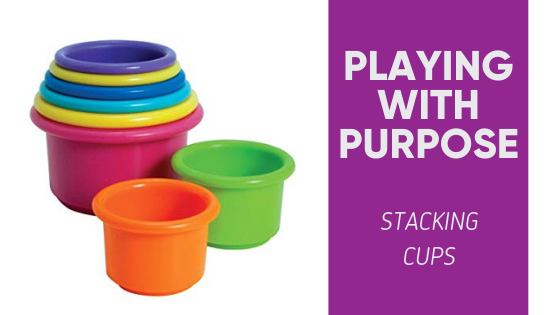 Have fun Playing With Purpose using your stacking cups….build on! 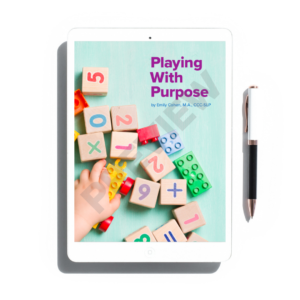 Want to learn more strategies for Playing With Purpose with your little one?